At the beginning of this school year, after mentally pulling my hair out for a few weeks with way too many stressful mornings with my 4 little ones, I created 2 sets of reminder lists for the kids’ morning routine. My goal was to put the responsibility for getting ready back into my 4 kids. I still do inspections to make sure items are completed which is a lot less stressful than being the reminder for 4 kids. The Room List, aptly named, is for after breakfast. Each set of kids sharing a bedroom is responsible for getting dressed, making their bed, tidying the room, and bringing the dirty laundry downstairs. I’m encouraging the kids to be responsible for their space and to help each other with a chore. My ultimate goal is to make sure my younger kids are not as messy in their rooms as my oldest son. Unfortunately, I didn’t know enough at the time to train him in good habits. 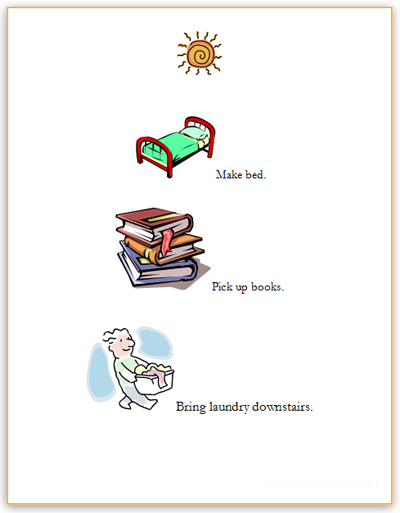 My list for the preschooler/kindergartener is designed for nonreaders. 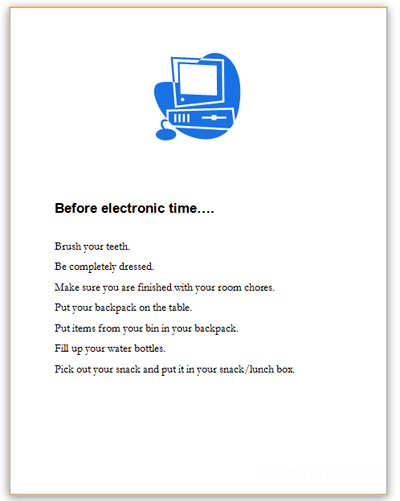 The Before Electronics List covers lunch bags and getting ready for school. We have electronics time only from 7:00 to 7:30 in the morning. If a kid misses it, or starts late, there are no make ups. In the fall, I took responsibility for packing the lunches. Starting this month, I put the responsibility for filling water bottles and packing snacks on to the kids. I hang around to help them since I don’t have a dedicated snack spot due to space issues. 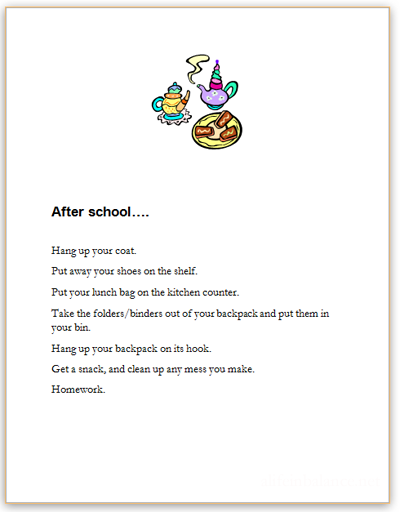 In addition, we have an After School List. My kids do understand their afterschool routine though it helps both of us if there’s a list to remind them when they forget. 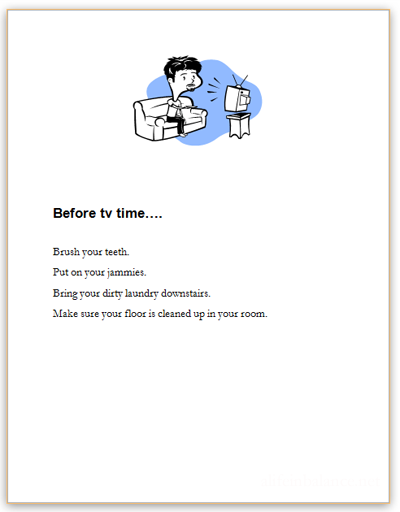 Finally, I did an Evening List of tasks to do before tv time. I wrote this list mainly because I moved the task of bringing dirty laundry down to the evening since the kids had fewer tasks then. 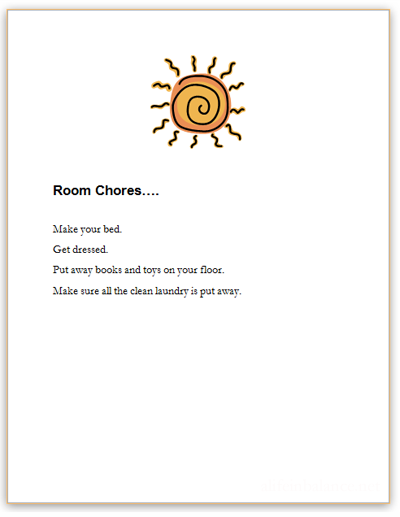 Do You Have Routine/Chore Lists for Your Kids? I’ve been meaning to do this but figured I’d have to wait until I have readers… but I love the images list! I can easily whip that up for my oldest! All my images came from the clip art in Microsoft Word. There’s lots of free clip art online, too. I love your lists. We have something similar for our kids and it works great. I really love that it helps them to be more responsible for themselves. I love your lists for your kids. I think it’s great you are helping them developing great habits! Thanks for linking up with us #ShareYourLife! Great ideas — love the non-reader list! My kids “forgot” their chores until I started putting it in a list and they couldn’t “forget”. That helped so much. I also like the idea of dividing the chores into morning and evening, too. Thanks so much for linking on Busy Monday! Spreading the chores out helps so much. I would definitely try it.